Mechanic tool sets come in different varieties and designs perfectly suited for various consumer applications. Besides their mechanical use, tools in these sets also have industrial applications. That aside, these tools are forged from chrome-vanadium for strength and durability. All most all the tools; ratchets, wrenches, sockets, screwdrivers, and even pliers feature a chrome finish for enhanced aesthetics and corrosion resistance. An ideal mechanic tool set is equipped with essential hand tools for home, office and garage repairs and fixes. You want to hang something in the house, twist some bolt in the garage, and you need some handy mechanic tools. And there’s no better way to access such tools than with a mechanic tool set. There are a great many varieties of high-grade mechanic tool sets in the market. There’s no doubting the confusion and indecisiveness that comes with wide assortments, especially when shopping. That is precisely how some consumers feel when they go shopping for a quality mechanical tool set; overwhelmed and spoilt by choice. This review seeks to help you take the guesswork out of shopping. We have provided detailed descriptions for each of our sampled high-grade ergonomically designed mechanic tools sets. For automotive fixes and basic home or office repairs, choice of the right tool for the job is key. A Mechanic tool set is essentially an assortment of essential hand tools. They are perfectly suited for basic repairs and fixes at home, in the office, and garage. 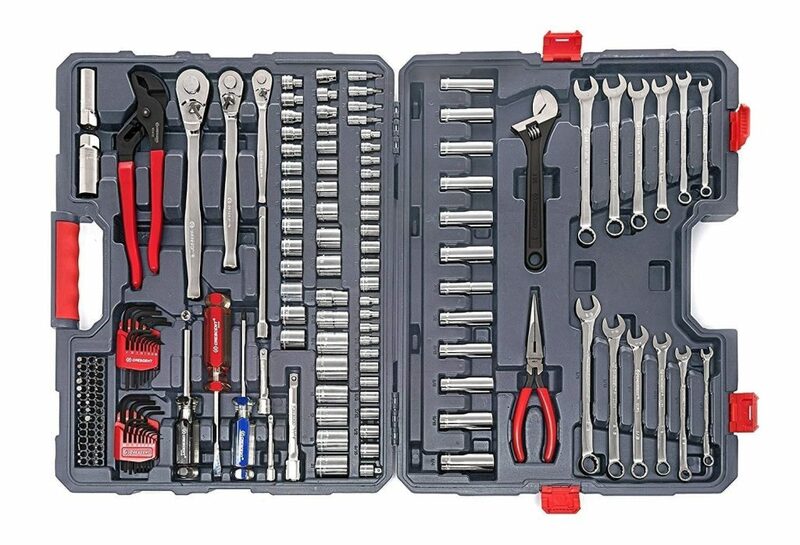 The Hi-Spec 67 piece SAE auto mechanics tool set is compactly built for portability and storage. The tools forged from chrome- vanadium for strength and durability. The sockets, screwdrivers, and some wrenches are vapor-blasted to survive the toughest work conditions. 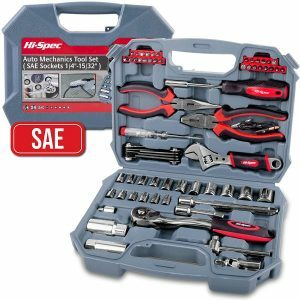 You want to stay prepared for emergency repairs in the house, office, garage, in & around automobiles, the Hi-Spec 67-piece SAE auto mechanic tool set is all you need. Variety: an assortment of high-grade sockets, wrenches, ratchets, etc. SAE sockets – quick release ratchet: constitutes a 72 teeth professional grade 3/8” ratchet drive handle with a comprehensive selection of most sought after 5/32” – 3/4″ SAE sockets. Hand socket accessories: SAE adaptors, universal joints, slide T bar, etc. Other hand tools: Hi- Spec 67 Piece SAE general DIY and specialist tools including volt meter and earth terminal leads. Quality guarantee: all Hi-Spec tools are ANSI approved. 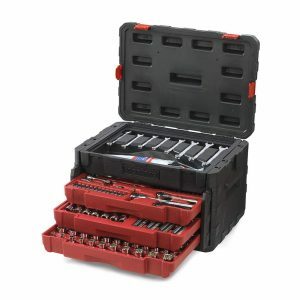 Hi-Specs 67 piece SAE mechanic tool set has a robust portable storage case. This protects your tools against the elements. Features heavy-duty combination pliers (150mm / 6 inch) with coarse teeth for excellent grip. The tempered blades can also be used to cut steel wires and fasteners. This tool set comes with a heavy duty long nose pliers (150mm / 6”) for easy wire manipulation. This is also used for easy grabbing in tight spaces. It comes with 8X metric Hex keys for easy assembling of towel bars, bookshelves, door handles, etc. Want to do some fixing around the house? Kingorigin tool set is all you need. All the 95 piece hand tools are made of carbon steel for strength and durability. The toolkit measures 16.3” x 10.2” x 3.0” and weighs only 8.8lbs. As such, it is very portable and easily stows away in small spaces. 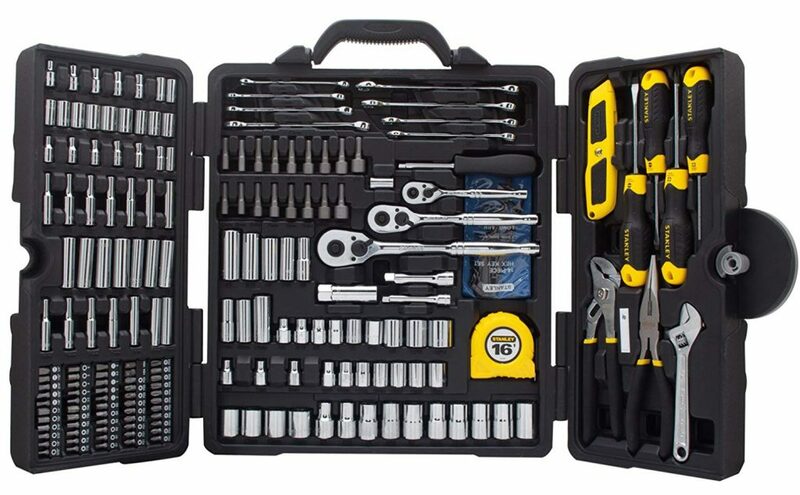 Kingorigin 95 piece home repair tool kit is ideally designed for mechanical as well as general repairs. The self-contained durable blow molded case contains a knife, water pump plier, screwdrivers, diagonal cutting pliers, combination wrenches, bit driver handle, spark plug socket 3/8mm x 21mm, 3/8” dr. extension bar, 3/8” dr. sockets, and 1.5mm – 6mm hex key wrenches. Construction& Design: self-contained durable blow molded case. 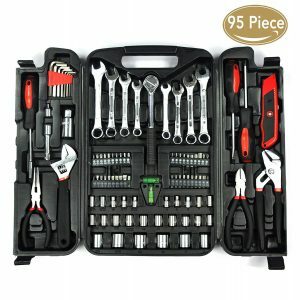 Kingorigin 95 piece tools set is best suited for small repairs around the house, office, and garage. All the tools are made of high-grade carbon steel for strength and durability. It measures 16.3″ x 10.2″ x 3.0″ and weighs 8.8lbs hence very portable and takes up the least storage space. The Kingorigin 95 piece tool set comes in a durable blow molded case that protects your tools against the elements. WorkPro 320-piece mechanics tools kit features a heavy duty blow molded case box for unparalleled tool protection. It comes with professional sockets; ¼ inch, 3/8inch, and ½ inch quick release ratchets. Each of these come with a 45-tooth gear system for a smooth 8o swing. Its sockets are made of heat treated chrome- vanadium steel for strength and durability. Metric and SAE socket sizes are easily identifiable, thanks to the trademark stamped markings. This sturdy tool kit is compact and lightweight for enhanced portability and storage. WorkPro 320-piece hand tools are ANSI approved. As such, they are best suited for small repairs at home, in the office, or even at the garage. Some of the tools in this kit include 1 x magnetic bit driver handle, 40PC hex key, 23 x ¼” DR. sockets in metric & SAE, 21 x ¼” deep sockets in metric & SAE, 12 nut drivers, 5 x 3/8 DR. SAE sockets, 4 extension bar, etc. Ratchet handle: chrome plated for durability and corrosion resistance. Sockets: have a matte finish for easy identification of the universal tools. Bit sockets: built of chrome-vanadium and heat treated steel alloy for strength and longevity. Bit holder & 1-inch bits: constructed from S2 steel with grit blasting for durability and strength. The bit holder also has a magnetic holder for smooth operation. Combination wrench: chrome plated for corrosion resistance. Sizes: marked in metric and SAE for easy identification. WorkPro 320 piece mechanics tool kit comes in a compact blow molded case for easy transportation and storage. It features a heavy duty design for durability. It has a combination wrench with sizes marked in metric and SAE for easy use during repairs. The tools are built of heat-treated chrome- vanadium for strength and durability. All the universal tools in the case feature an industrial matte finish for easy identification. Stanley STMT73795 comes in an easy to carry, trifold case featuring a twist lock for improved mobility and secure storage. Its tools are all made from forged chrome- vanadium for strength, durability and high torque needed during operations. Stanley brand tools also have a characteristic chrome finish for corrosion resistance and luster. The blow molded carry case supports easy organization and arrangement of all tools within the kit. It is also lightweight and compactly designed for enhanced portability. All tools within Stanley STMT73795 mixed 210 piece tool kit meet and even exceed ANSI quality standards. This versatile mechanic tool set is best suited for home, office or garage use. It comes with a variety of SAE and metric sockets ranging from ¼” to ½” drive sizes. Also included in the set are SAE and metric combination wrenches, ratchets, and other accessories. Construction: Chrome- vanadium forged body for torque, strength, and durability. Sockets: includes a variety of SAE and metric sockets ranging from ¼” drive and ½” drive sizes. Others: SAE and metric combination wrenches, ratchets and other mechanic tools. Stanley STMT73795 tools feature a chrome- vanadium forged body for excellent torque, durability, and strength. The tools have a signature full polish chrome finish for enhanced aesthetics and corrosion resistance. This mechanic tool set meets ANSI quality standards. Stanley STMT73795 has a lifetime warranty for repair and replacement of faulty tools. This mechanics tool set includes quick release ratchets in ¼”, 3/8” and ½” drive sizes as well as 152 sockets. These are available in metric and inch sizes. Its 4 extension bars are invaluable in extending your reach during repair operations. Craftsman 320 piece mechanic tool set has 8-combination wrenches for easy twisting and turning at constricted spaces where ratchets won’t access. Also noteworthy are their magnetic handles with up to 12 nut drivers in inch and metric sizes. Its 96 screwdriver bits allow proper control and high precision power delivery during operations. The 40 hex keys and adapters add to this tool kit’s versatility. 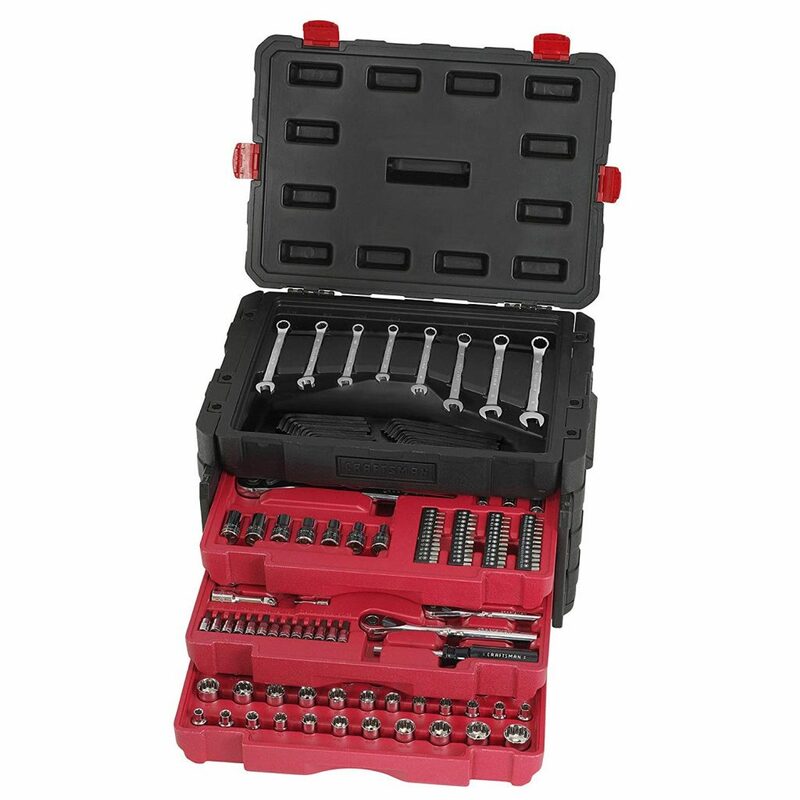 Craftsman 320 piece mechanic tool set is made of high-grade blow molded carry case for easy storage and portability. It has a total of 152 sockets in metric and inch sizes. These make the repair works very simple. It has a magnetic handle featuring some 12 nut drivers in inch and metric sizes for easy fixing, twisting and even turning. Its 40 hex keys, 4 adapters, and quick-release ratchets in ¼”, 3/8”, & ½” drive sizes are used alongside 4 extensions bars for reach extension. This mechanic tool set is compactly designed for on-the-go auto repair enthusiasts. It features a high-grade blow molded case that guards the tools against the elements. The casing weighs 18.05 pounds and is compactly designed, 19.2” x 15.2” x 3.8,” for easy storage and portability. DekoPro 192 piece mechanic tools kit has some essential household, office or garage repair tools. You want to do some hanging, tightening of nuts and screws, box opening, this is the perfect starter kit. It is best suited for home as well as in & around vehicle repairs. All the tools are chrome- vanadium forged for strength and durability. For corrosion resistance, DekoPro 192 piece mechanic tools are chrome plated. Requisite tool set: has tools for basic household repairs. Anticorrosion: chrome plated steel tools. Construction & Design: It comes in a sturdy blow molded compact case for easy storage and transportation. Service: the manufacturer guarantees quality services before and after sales. Originality & Uniqueness: It comes in a diamond-shaped black carry case. It measures 14.96” x 3.96” x 17.72” and weighs only 17.86lbs hence very portable. It also stows away easily in small storage spaces. The tools are ANSI approved and are therefore built to last. For every purchase of DekoPro 192 piece mechanic tool kit, the manufacturer promises the best service before and after sales. All the tools in the kit are chrome- vanadium forged for strength and longevity. They are also chrome-plated for corrosion resistance. Dewalt mechanic tool set comes with a signature knurled non-slip beauty ring for improved grip. Its low profile directional lever eliminates catch points. It also promotes single-handed operations. For high torque ratcheting, this tool set features a 72-tooth gear system. The 5-degree arc swing and slim head design support easy maneuverability in tight spaces. Its blow molded carry case protects the tools against the elements. Also, the Dewalt 204 piece mechanic tool set is also compactly designed for enhanced portability. It comes with a limited lifetime warranty for all tools and accessories. This takes care of free replacements and repairs of faulty tools and accessories. Its 72 tooth count ratchet is equipped with a quick-release button for easy attachment and removal of sockets. The Dewalt 204 piece mechanic tool set comes in a knurled non-slip beauty ring for improved grip. Its 5-degree swing and slim head design enhance maneuverability in constricted spaces. It has a limited lifetime warranty for all parts and components. The tools are made of chrome- vanadium for strength and durability. They are also chrome plated for corrosion resistance. 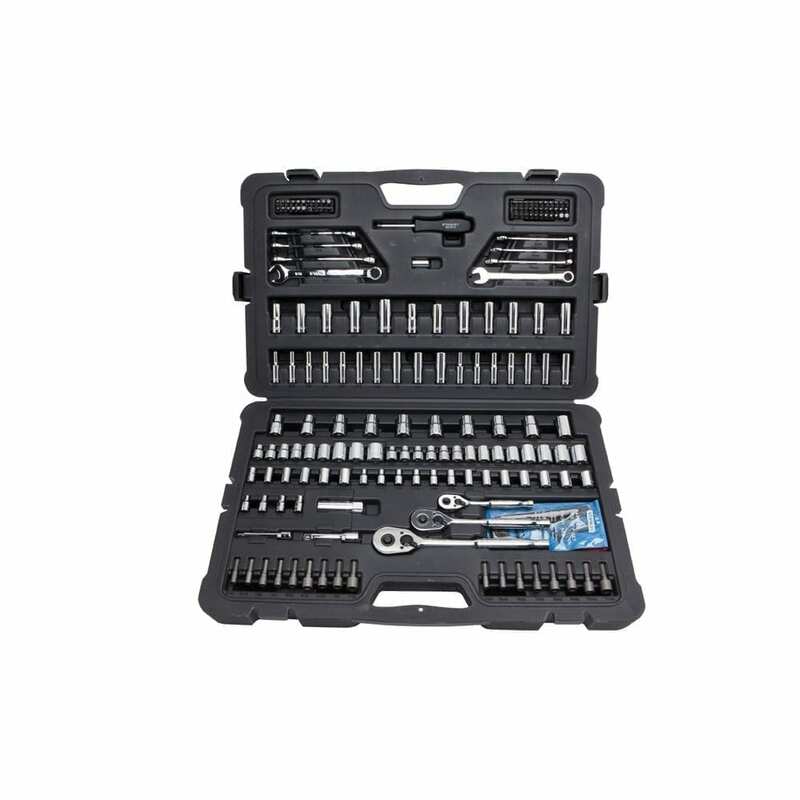 This mechanic tool set has a complete range of SAE & metric size sockets and drives. The tools are forged from carbon steel for strength and durability. They are also finished with high sheen black chrome or nickel chrome for corrosion resistance. Its thumb-operated ergonomic ratchet handles are reverse switch-enabled for improved access to constricted spaces. 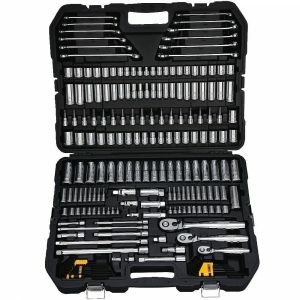 Stanley STM71654 201-piece mechanic tool set has sockets, wrenches, ratchets, extension bars, among other hand tools. The sockets and extension bars both remain locked onto the drive throughout repair operations. At the end of your repair, you can disengage them using an integrated low profile quick-release button. Included tools: ¼”, 3/8” and ½ inch round head, quick release ratchets. 8 combination wrenches: ¼”, 3/8” and ½” round head quick release ratchets. Stanley sockets feature a unique Max-Drive design. This feature provides 15% more torque for much easier tightening of fasteners. It also simplifies turning at constricted corners. Max Drive reduces fastener wear and tear. This it does by minimizing contact on the outer 15% of the fastener. All Stanley ratchets, wrenches, and sockets are expertly designed according to ANSI specifications and standards. The blow molded carry case is compactly designed and measures 26” x 10.9” x 2.7” for easy storage. It weighs only 17.5 pounds hence very portable. The tools are chrome plated for corrosion resistance. They are made of forged chrome- vanadium for strength and durability. The crescent CTK170MPN 170 Piece mechanic tool set has some of the best ratchets, wrenches, and sockets. Each of the 3 heavy duty ratchets feature a compact teardrop-shaped head. This supports easy maneuverability in small spaces. The ratchets also have balanced handles for better leverage and control during repair operations. To keep your tools safe and secure, this mechanic tool set comes in a heavy duty blow molded case. Its inbuilt cushioned handle steel hinges and 4 sturdy latches improve its durability. 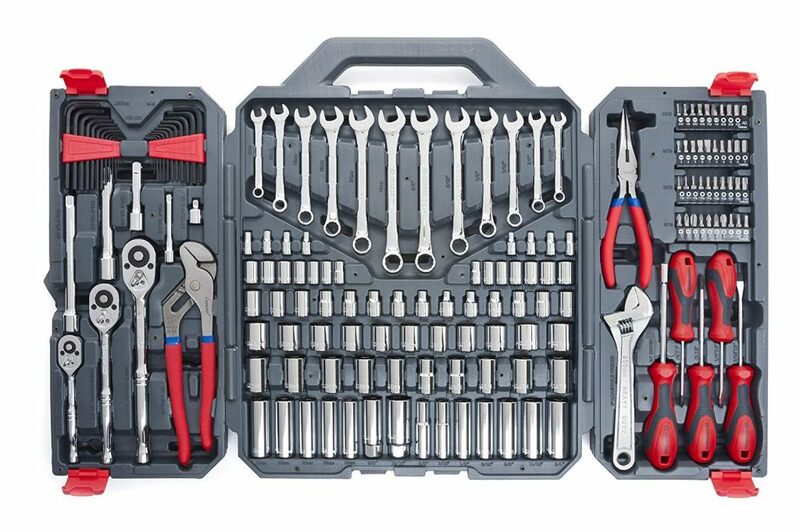 Crescent 170 piece mechanic tool set has sockets with off-corner loading technology. This eliminates the need for fastener rounding. For durability and strength, all the tools and appliances are made of chrome- vanadium steel alloy. This alloy is also heat treated and specially formulated for corrosion resistance and durability. The updated version of CTK170CMP2: new and studier blow mold carry case with 4 latches and steel hinges. The upgraded kit tools: Longer wrenches with narrower heads, pliers, Crescent brand wrench, Torx bit sockets, acetate screwdrivers and a new ratchet design with 10% longer beam and smaller teardrop head. Quality: All tools meet stringent new ANSI and ASME specifications. Drive tools: ¼”, 3/8”, and ½” metric and SAE drive tools. The tools in Crescent 170 piece mechanic tool set have a polished chrome finish for an easy clean by a simple wipe. It has SAE and metric hex keys with slide-to-open holders and unique individual tilt-out feature for easy access to any key. Ratchets come with quick release buttons for easy change of sockets. Its 60-tooth gearing system turns fasteners with a 6-degree swing for easy maneuverability in tight spots. The tools are made of chrome- vanadium steel alloy for strength and durability. They are also specially formulated and heat treated for corrosion resistance. 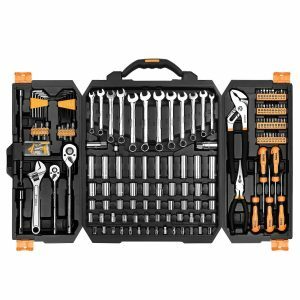 If you are looking for invaluable tools for basic repairs at home, in the office, and at the garage, Crescent CTK170CMP2 170-piece mechanic tool set is worth checking out. It has a compact blow molded case for easy storage and portability. This mechanic tool set contains an assortment of excellent Crescent brand hand tools suitably designed for industrial, mechanical and other consumer applications. All the wrenches, ratchets and sockets have a corrosion-proof chrome finish. They are made of chrome- vanadium steel alloy for durability. The alloy is heat treated and specially formulated for superior strength. Some of the tools in the set include ¼”, 3/8”, and ½” quick-release ratcheting drives. These come in SAE and metric sizes. Also, there are 12 SAE and metric combination wrenches, 2 pliers, 8” adjustable wrench, 4 screwdrivers, magnetic bit drivers with 44 driver bits, and 26 SAE and metric hex keys. All Crescent brand tools meet the stringent ANSI and ASME specifications and standards. Quality specification: ANSI and ASME approved. All the wrenches, ratchets, and sockets are plated with a flawless chrome finish for durability. The tools are made of chrome vanadium steel alloy for strength. Ratchet gears, pawls, and screwdrivers all have vapor-blasted tips to extra strength. The Crescent CTK170CMP2 170 piece mechanics tool set is compactly designed for portability and easy storage. All the tools in the set meet the new ANSI and ASME standards of quality. That marks the end of our in-depth review of some of the best mechanic tool sets. For each product, we have provided a detailed description including key features and associated pros. Compare and contrast each of the enlisted mechanic tool sets to get the best purchase. Also be sure to follow the associated Amazon links for details on price and other product features.